Is Gold at a Turning Point? 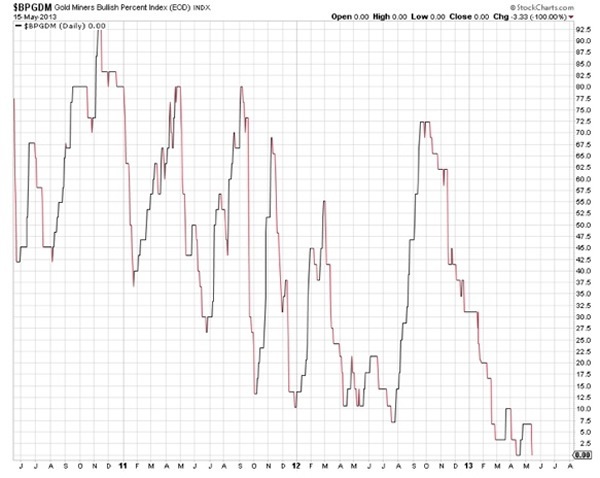 The past two years have not been kind to holders of the precious metals. The price of gold is down over $500/oz since the record high (nominal) price it hit in August of 2011. That's a decline of 28%. Silver has seen a decline of 56% over the same period. On top of these grim charts, daily headlines touting, often with delight, the demise of gold appear nearly everywhere in the media. Wasn't reckless central-bank money printing going to flood the world with paper currency, sending gold prices – and those of its "poor man's" sister, silver – to the moon? Weren't the markets going to crack as the unresolved economic and financial rot in the U.S., EU, and Japanese systems became further exposed, sending capital fleeing into the bullion market and driving prices much, much higher? 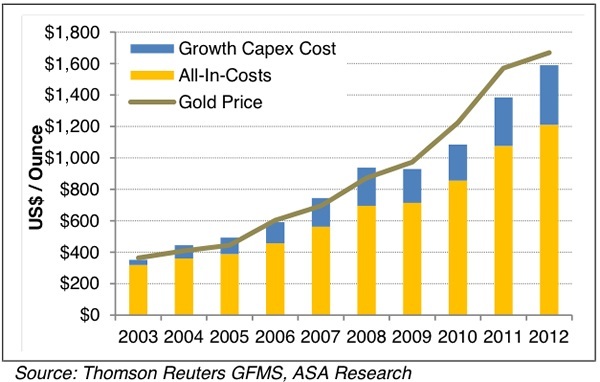 Weren't escalating mining costs going to march up the price floor for the precious metals? Why haven't any of these scenarios happened? 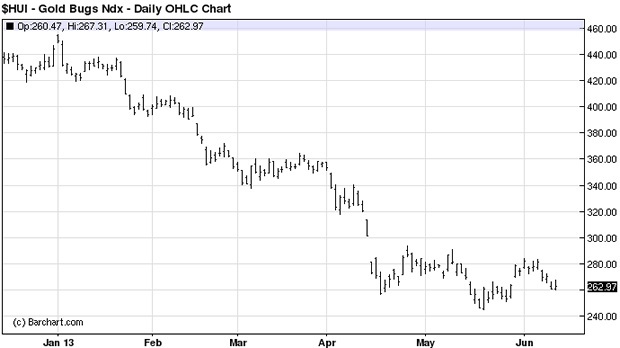 Were we wrong in our reasons for purchasing gold and silver? Are we the clueless patsy at the poker table? These are very understandable questions to be asking. You wouldn't be human if you didn't. So, it's wise to return to the #1 lesson of investing: Never fall in love with your positions. Be sure to question your rationale regularly and often. Remove emotion from your decision-making, look to what the data tells you, and continually ask yourself: Ignoring my past decisions, would I purchase this investment today? If the answer is no, lightening up your position is almost always the right decision. Chris and I follow the precious metals markets on a daily basis, and we frequently challenge the logic behind our support of them. But at this time, we can find nothing – nothing – that has happened over the past two years that invalidates the principal reasons we've laid out for owning precious metals. The hard truth for us investors is that secular market trends take time to play out. Nothing moves in a straight line. And they are many false signals along the way. There are no sure bets, no risk-free winning options to pick. But the good news is that the laws of physics and rationality always prevail in the end. If you can identify the right endgame and position yourself for it patiently, the messy volatility along the way really won't mean much in the big picture. The price of newly mined ounces continues to climb higher and higher, due both to reduced ore grades and higher costs for fuel and equipment. Negative real interest rates have always been supportive of gold prices. While admittedly that's not been the case for the past two years, we now see that historic relationship re-expressing itself. 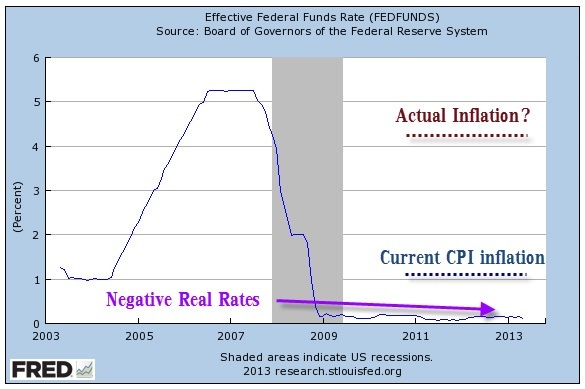 After all, when the return on cash savings is virtually nothing and the money printers are running, inflation eats away at fiat purchasing power. Gold, as money, offers protection from this. Perhaps things are different this time, but we're thinking not. The degree of fiscal and monetary recklessness has taken us by surprise, both for the intensity of the actions already taken, but also for the fact that financial markets have adjusted to the practices and now treat them as normal, if not desirable. While the U.S. deficit has been declining from its record highs, much of that is due to accounting shenanigans, all while our dangerously high debt-to-GDP ratio (as well as those of most other developed countries) continues to worsen. 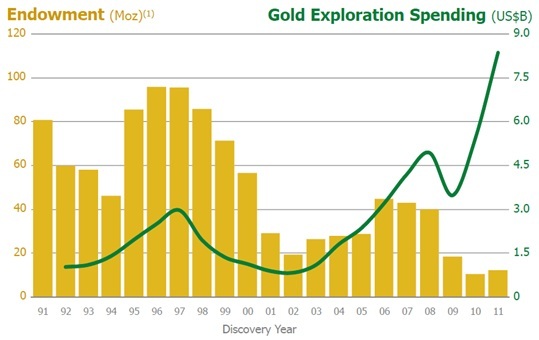 Gold, it seems, is getting both harder to find and harder to get out of the ground. And one last big one: a new secular change in rising interest rates that threatens to create havoc in world economies and financial markets across the world. 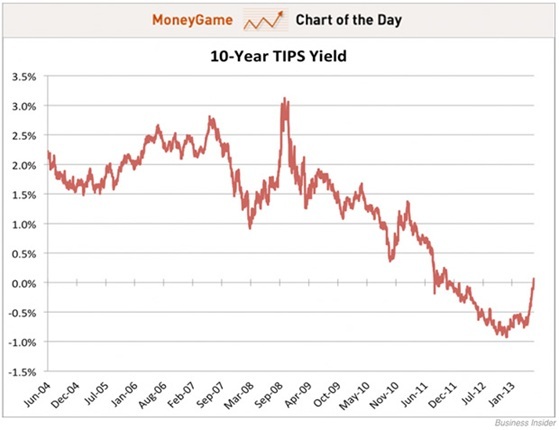 After a decade of low and declining interest rates, yields are back on the rise. The low cost of debt that the markets have become used to has created a worldwide bubble in bond prices, about which experts like Bill Gross have been increasingly vocal in issuing dire warnings. A popping of this bubble will increase borrowing rates for governments/business/consumers, depress home prices, make mortgages more expensive, and basically act like kryptonite to any "recovery" in the world economy.